At the Gelb Sports Medicine & Orthopaedic Center, onsite digital X-ray technology provides convenience to patients and assists our medical staff in efficiently diagnosing musculoskeletal conditions. In addition to diagnostics, digital X-rays are also periodically used by orthopaedic surgeons to help evaluate the progress of treatment. As with other medical personnel on staff at our orthopaedic practice, the X-ray technicians are expertly trained to assist patients and physicians alike. The staff X-ray technicians have many years of experience − producing optimal images for reviewing the area of the body being evaluated. Periodically, a patient will be asked to pose in such a way that facilitates the imaging process. 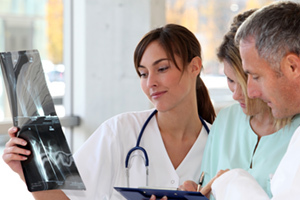 X-rays used for diagnostic imaging are produced using low-level radiation at a targeted spot. The process is painless, yet significantly beneficial for proper analysis and treatment.